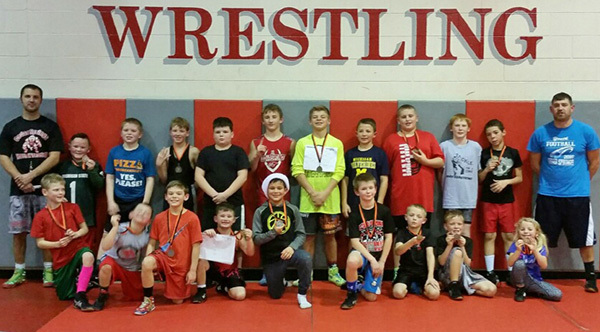 Cedar Springs Youth Wrestlers that won at the Rockford Open and Novice tournament last weekend. CSYWC had 39 wrestlers head to Rockford to compete in the RYWC Open & Novice tournament Sunday, December 17th joining 72 teams from all over the state. There were 528 wrestlers looking for the top spots in their weight classes. “We had lots of wrestlers out today and we saw a lot of great matches. We had a handful of wrestlers step on the mat to compete for the very first time and they wrestled very well. We went 68-63 today but had 26 medal. I can’t wait to see how everyone progresses throughout the season,” said Coach Jake Marsman. Taking home the 4th place medals for the team were Brycen Alber, Taylor Crystal, Cameron Ellison, Zach Vu, Gavyn Byxbe, Urijah Bates, Deegan Pike and Wyatt Cooper. The 3rd place finishers were Logan Galinis, Jaxon Fitzgerald, Tucker Crystal, Dakota Winchell, Brenden Johnson and Rory Shoenborn. The 2nd place grapplers were Jonathan Libera, Jayce Karafa, Hudson Crystal, Blake Falan, Thomas Prins and Conner Dines. This Sunday’s CSYWC Champions were Ben Streeter, Tucker Dines, Nolan Myers, Carter Falan, Logan Troupe and Maston Wood. Congratulations, wrestlers! Deegan Pike had the most pins for the team and was 25th over all with 3 pins in 4:30. Conner Dines was 32nd with 3 in 5:41. Cameron Ellison was 57th with 2 in 1:44. Carter Falan was 100th with 2 in 3:54. Maston Wood was 18th in fastest Technical Fall (wrestling’s version of the mercy rule) winning 17-2 in 2:41. Hudson Crystal tied for 41st winning 16-0 in 4:30. Conner Dines had the fastest pin for the team and tied for 15th with :18, Alex Hanes tied for 60th with :32, Ben Streeter tied for 68th with :35 and Cameron Ellison tied for 98th with :44. Carter Falan and Logan Troupe tied at 21st over all with the most team points for the day with 22.0, Tucker Dines tied for 40th with 20.0, Deegan Pike and Blake Falan tied for 64th with 18.0 and Conner Dines tied for 80th with 17.0. Conner Dines and Alex Hanes tied for 13th with 18 single match points. Maston Wood tied for 22nd with 17, Hudson Crystal tied for 39th with 16, Gavyn Byxbe and Taylor Crystal tied for 82nd with 14. Rory Shoenborn tied for 15th in total match points with 38, Conner Dines tied for 20th with 37, Tucker Dines tied for 24th with 35, Deegan Pike tied for 49th with 30, Henry Galinis tied for 57th with 29, Brycen Alber, Alex Hanes and Maston Wood tied for 64th with 28, Hudson Crystal tied for 73rd with 27, Taylor Crystal, Cameron Ellison and Zach Vu tied for 90th with 25.